For many of us a trip to Walt Disney World is a dream come true, and one which we have planned and saved up for months or even years. Disney World contains four distinct theme parks: Magic Kingdom, Epcot, Animal Kingdom, and Hollywood Studios, plus two water parks, and Disney Springs shopping, dining, and entertainment complex. It is definitely one of the most popular vacation destinations in the world. But, what do you do when the “rain, rain, rain comes down, down, down” at this “most magical place on earth”? In this article, I will highlight 10 fantastic ways to enjoy the Magic Kingdom, even if it’s a rainy day. 1. Rainy Day Parade – Even though Florida is known as “The Sunshine State” the weather can be tricky, with sudden afternoon thundershowers, and there are even days when the rain refuses to go away. When there is a parade scheduled but cancelled due to rain, another event occurs, the “Rainy Day Character Calvacade”. This is a parade where the cast members are dressed in raincoats, rain boots, and rain hats, and many of the Disney characters are riding along in a slowly moving antique car, a double decker bus, while the Disney princesses dressed in their beautiful gowns are waving and smiling from a moving gazebo travelling down Main Street. The die-hard Disney fanatics who are not deterred by the rain, have a great opporutnity to get photos and video of a rare and extremely fun parade. I’ve seen this rainy day parade, and the cast members have such a good time interacting with the small crowds in a festive and comical way. A rainy day seems to bring out the sunshine in cast members and parade goers alike. 2. Character Meet and Greets (Indoors) — A good way to spend a rainy afternoon or morning is to meet your favorite Disney characters. Here are some of these great character Meet and Greet indoor locations: Pete’s Silly Sideshow (Storybook Circus/Fantasyland). In this circus-like structure you will enter the world of the Circus Sideshow. Here you can meet with the amazing Donaldo, the great Goofini, Minnie Manifique, and Madame Daisy Fortuna. At Town Square Theater on Main Street Mickey Mouse and Tinker Bell will be delighted to make your acquaintance. Visit with your favorite princess at Princess Fairy Tale Hall in Fantasyland (Cinderella, Elena, Rapunzel and Tiana), and say hello to Ariel in her private grotto next to her attraction, Journey of the Little Mermaid in Fantasyland. In Adventureland, follow the magic carpet to the Marketplace where you can visit with Aladdin and Jasmine. 3. Monorail — A ride on a WDW Monorail in the rain is a unique expeience. No only are guests relieved to get out of the rain, but a ride on the monorail is always a great way to get a bird’s eye view of the Magic Kingdom and some of Walt Disney World’s finest Resorts. Since it’s raining, now would be an excellent opportunity to visit one of these deluxe resorts, do some window shopping, or have a nice lunch. If it looks like it’s going to be a rainy day, board the monorail and visit another Resort, or just return to the Magic Kingdom and wait it out. You can also ride the Epcot Monorail, and if its still raining, disembark and reboard the next monorail returning to the Magic Kingdom. 4. Liberty Belle Riverboat — If you are in Liberty Square and the rain begins to fall, make your way toward the boarding area of the Liberty Belle Riverboat for a relaxing scenic tour on the Rivers of America, circling around Tom Sawyer’s Island. The waiting area is completely covered, so you will stay dry while waiting to board this beautiful 3-tiered Colonial-American-inspired riverboat. Once on the Liberty Belle, there are plenty places to stand or sit where you will stay dry and get a great view of such sights as an early American settlement, a Native American village, Harper’s Mill, Fort Langhorn, woodland animals including deer, Big Thunder Mountain Railroad, Splash Mountain, and the Haunted Mansion. Take some time out, and enjoy this leisurely trip on the Rivers of America, enjoying the sights and sounds of the American frontier. 5. Indoor Attractions — Walt Disney World never shuts down because of rain. Once the rain begins, the ponchos and umbrellas come out of hiding and make appearances in just about every shop in the Magic Kingdom. But for guests who are trying very hard to avoid getting wet, there are so many indoor attractions that you can enjoy while staying dry. Of course, you may get a little wet getting to these attractions, but if you’re very careful, you can use the cover of builidngs and attractions to make your way easier. Some of these indoor attractions are Monsters, Inc., Space Mountain, Journey of the Little Mermaid, Enchanted Tales with Belle, It’s a Small World, Peter Pan’s Flight, the Haunted Mansion, Hall of Presidents, and Pirates of the Caribbean, just to name a few. No matter which land you happen to be visiting when the rain begins, there is an indoor attraction or ride nearby. 6. Tomorrowland Transit Authority PeopleMover — Even though it may be raining, the boarding area is covered, and the moving tram cars travel on a track that is covered, so even though you are always in the open, you can avoid getting drenched while enjoying this relaxing tour in and out of popular attractions and unique futuristic shops. What I really enjoy about this iconic ride is the smoothness of the tracks, the entertaining narration, passing through dark rides like Space Mountain and Buzz Lightyear’s Space Ranger Spin, and looking down on people while they shop. Now if its raining really hard, you might get slightly damp, but you’re constantly moving, and you’re not in the open the whole time. If you want, disembark, ride the moving conveyer belt down to the entrance, and ride again. At least you’re out of the rain and on a delightful tour of Tomorrowland. 7. Dining — There are so many dining choices at the Magic Kingdom, and just like the rides and attractions, there are places to get a meal or a snack in every land. What better way to get out of the rain than to have a delicious meal or snack in one of the Magic Kingdom’s unique and entertaining eateries. Take a break, get out of the rain, and chow down on some excellent food choices; such as a hot dog meal from Casey’s Corner, a flatbread pizza from Pinochhio’s Village Haus, or an elegant meal at the Be Our Guest Restaurant or a buffet breakfast, lunch, or dinner at the Crystal Palace. If you’re not ready for a full meal, but just a “waiting for the rain to stop” quick snack, there are plenty of quick service restaurants where you can order side items and drinks. This is also a good opportunity to look over your plans for the day and make any adjustments because of the weather. 8. Shopping — As with attractions, rides, and dining, there are literally hundreds of shops in and around the Magic Kingdom. Every land is filled with shopping venues, and a majority of them are indoors. My advice on shopping when it’s raining is the Main Street Emporium, the largest gift and souvenir shop in the Magic Kingdom. The Emporium is actually made up of 5 separate stores that are all connected. You can literally walk through every store without ever leaving the building. As you enter the Emporium from Town Square, you travel through the shops on the left side of the street and end up at Casey’s Corner, a quick service, counter restaurant. If you’re coming from the hub in front of Cinderella’s Castle, and the rain begins, duck into Casey’s Corner and enjoy a quick snack, or make your way to Town Square by strolling through all the shops of the Emporium. If you’re really lucky, and if a parade was scheduled but cancelled because of the weather, you will most likely have a rare opportunity to enjoy Disney World’s Rainy Day Character Calvacade Parade. The Main Street is my favorite place to shop at Disney World, but it’s not the only place to shop. Whatever land you happen to be in when the clouds roll in, there is sure to be a unique specialty shop nearby. 9. Walt Disney World Railroad —Yes, the railroad cars are open air, but especially in the summer months, taking a trip on the WDW Railroad is not only relaxing, entertaining, but also refreshing. That cool breeze combined with a light misting from an afternoon rainshower, and the sound of the clackety clack of the train is enough to put you to sleep. The circle tour of the Magic Kingdom is even more enjoyable by the delightful narration, pointing out special attractions along the way. A train trip, however, might not be as enjoyable in a downpour or tropical storm, but if the rain is intermittent, give it a try. Crowds usually thin out when the rains come, so you should be able to sit toward the middle of your bench and will stay relatively dry. 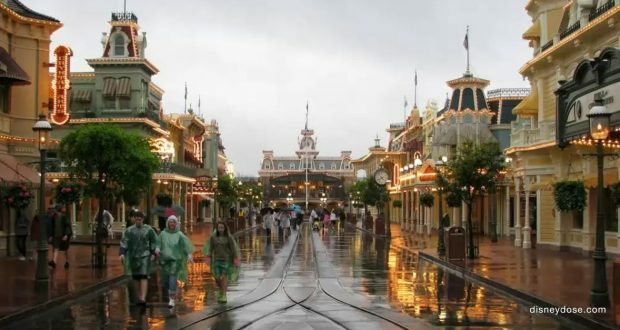 Well, there you have it; ten ways to enjoy Walt Disney World’ Magic Kingdom in the rain, and might I add despite the rain. The rain has never stopped my family from enjoying our Disney World vacation. Rain is just wetness. It doesn’t take away from the magic and joy that is a Disney theme park. It’s a momentary break in your plans. The sun will come out again, and after a good rainstorm, the air is refreshing, and the crowds are smaller. So, take my advice and learn to accept the rain as a part of your memories, and don’t be discouraged by a few attractions that shut down during a rainstorm. The rides and attractions are not the only element of a Walt Disney World vacation. There are so many ways to enjoy Walt Disney World, even in the rain.